Most bloggers are consistently working to better our blogs. And for good reason. Things like learning new ways to market and network, improving our blog and post designs, and staying inspired to produce great content are essential to helping our blogs shine and grow. Many of the questions I got in response to my post about our new FAQ page (which will be live soon!) involved asking which tools I use to assist in my blogging efforts. So I thought I'd put together a list for you guys of my favorite online resources that I utilize for Bubby and Bean, along with my suggestions for how to use them in ways that are actually beneficial. Google Analytics is an essential tool for learning about your blog traffic and visitors. You can find out exactly how many visitors you're getting, how many page views you're getting, how long readers are staying on your blog, how many pages your readers are viewing, where your traffic is coming from, and so much more. It's simple to set up and install, and once you spend ten minutes to do it one time, you're set. I check my Google Analytics account every few days, and it has helped me with everything from improving my content to knowing where and how I should focus on promoting my blog. Feedburner is a service that burns your feed and delivers it to various readers, but it's got a lot of other helpful features too. You can use it to track your reader stats, allow your readers to subscribe via RSS or email right on your blog, add "FeedFlare" so your subscribers have the option to tag, share or email your posts, set your content to automatically post to Twitter, and more. Twitter is an easy, effective way to interact with your blog readers on a daily basis and to attract new readers. In my experience, the key to using Twitter is to actually interact. Yes, post links to your blog posts. (As I mentioned above, Feedburner has a tool to do this automatically when a post is published.) But don't only post links. Participate. Read other tweets and respond to them. Retweet other tweets that you like. And share a little of yourself as well. You are a real person with a life outside of your blog, so why not tweet about that from time to time? Everyone is different and I'm certainly not a Twitter expert. But I personally like following others who tweet bits and pieces of their life or funny one-liners or inspiring quotes or pictures of something they did that day. I'm less inclined to follow people who only post self-promotion type tweets or have accounts that resemble news feeds. Dafont features tens of thousands of fonts that you can download and use for your blog's graphics and design, and most of them are free. Some other cool free font resources that I use include Urban Fonts, The League of Moveable Type, and Font Squirrel. To clarify, I am not suggesting using other blogs for the purpose of boosting your own. If anything, I (personally) believe that commenting on other blogs or networking with other bloggers with the sole intent of promoting your own blog is the exact opposite route you should take. But I am including this in my top ten favorite online resources, because it's one of the most important ways to enjoy your blogging experience. And enjoying your blogging experience, by default, will improve your blog. Community and working together are key elements to growth in any field. Reading other blogs and interacting with other bloggers will allow you to learn, find inspirations, and create friendships and partnerships. If you're a new blogger, you'll be amazed at how much your blog improves once you've spent some time enjoying other blogs and connecting with others in the community. For me, I find that I'm always more motivated to sit down and write my post for the day after I've read some of my favorite blogs or had some great conversations with blogging friends. I hope this list and the tips provided are able to help some of you who are looking to give your blogs a boost! Keep in mind, every blogger is different, and everyone has different resources and methods that may (or may not) work for them. These are just suggestions for tools that I enjoy using and that work for Bubby and Bean. 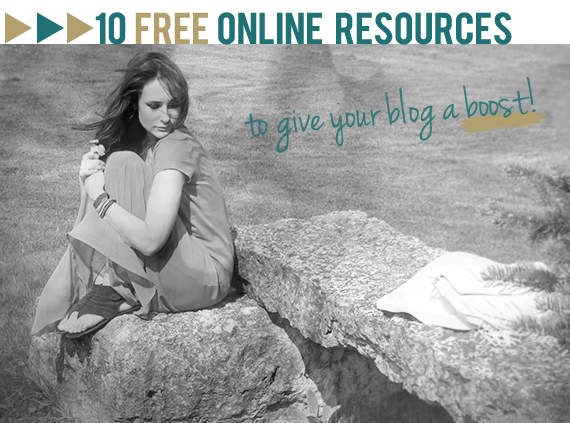 Do you have any favorite online resources that work well for your blog? thank you for this! really appreciate your sharing. Great tips! I'll have to check out bloglovin, I hadn't heard of it before. thanks for your great tips! I've just started using HelloCotton too, which is a great networking site for bloggers. that's a good idea about pinterest and it sounds daft to say but i'd never thought of it before! i am a little cautious about pinterest now though after all the controversial articles online regarding copyright laws being broken! thank you so much for the advice! i think this would really help blogger newbies! all great tips! I don't use facebook enough. I have the networked blog feed pulling my blog posts in, but I don't do enough commenting directly on FB. I'm usually only on FB via my phone app. and for some reason it just never seems to recognize me as my page, only as my personal account. grr. Thank you SO much for this post. Many of these tools I was aware of, but there a few that were new to me and I totally appreciate it! Love this. Great information. I haven't used feedburner yet but I will soon. It would be nice to have something automatically tweet my post. Great info Melissa! I've had traffic come from hellocotton lately! thanks for giving us all these great tips! I will be sure to use a few of them! I tried to follow most of the tips for my blog! thanks! Thanks for the photo editing links! I've been looking for something to replace Picnik! Melissa this is a wonderful post and also thank you for introducing me to Sugarlips in your other post, so cute! I love your line "and enjoying your blogging experience, by default, will improve your blog." It's true about life so I'm sure it's true about blogging. Thanks for some wonderful tips.